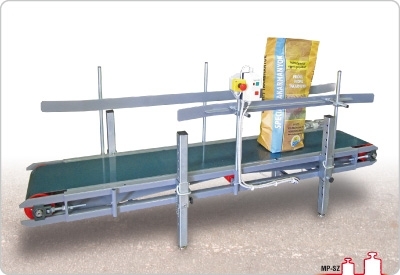 ﻿ Sewing machines, thread, conveyor belts - Bag conveyors | Metripond Plus Kft. Transports filled bags from bagging scale to sewing machine. The sack transport belts are primarily suitable to be installed with semi-automatic sacking scales, to the reception of the filled sacks coming off the scale and the transport of these from the scales.